It’s been nearly twelve months since I finished chemotherapy and thirteen months since I had a visit from Aunt Flo. I’ve always imagined Aunt Flo to be a slightly eccentric, slightly deaf, toothless, foul mouthed, shawl wearing, smoking, mad cross stitcher, with a hoarse voice that abruptly shouts at anything that moves. Nothing about my menstrual cycles have ever made much sense to me. Painful, loathsome and life disrupting. So imagine my happiness when chemotherapy locked the door on Aunt Flo for over a year. Everybody in the house shout “Yay to Cancer!” for Lisey. In recent months I have been experiencing loads of pelvic symptoms. Cramping, sharp pains, dull aches at night that wake me. Whispers of pain of sorts. And all of this even detectable while my household went through the worst flu and longest recovery I think we have ever had. Last week saw me get the news that I have cysts on my ovaries which tends to be common for pre menopausal women on Tamoxifen, err I mean Tamoxibitch. The drug does not lower oestrogen in a women’s body but changes its ability to connect with cancer. Akin to changing a lock and having the old key not work. And this is rather important given my grade three tumour was 98% positive for oestrogen. Well after nearly a year of sleeping, my ovaries are now working over time to get the show on the road. And it seems at present I have enough oestrogen to initiate a great coral spawning episode on the Great Barrier Reef. 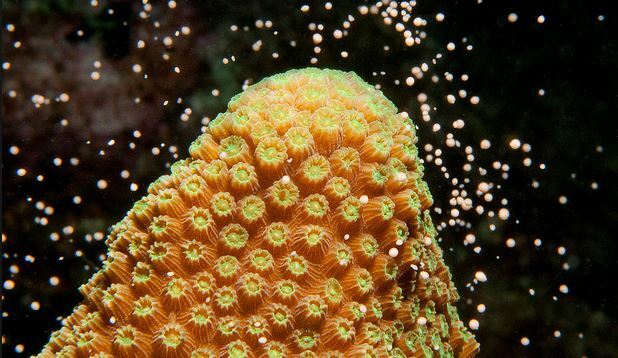 This image of coral spawning just makes me want to ovulate. Unfortunately one of the cysts is approaching seven centimetres in diameter and is “complex” in nature. Which means it’s got solid parts to it, and cancer cannot be ruled out. Rather than the simple, rounded, smooth clear fluid filled cysts that are observed on ultrasound, that women commonly get throughout their fertile years. It’s not easy getting around with a seven centimetre complex cyst in your abdomen. Sitting, coughing, laughing, weeing and pooing hurt. Sometimes walking hurts too. Normally, ovaries are the size of an almond or a walnut but swell to larger dimensions with cysts. Mine resembles a large lemon. Not that I have anything against lemons. I love lemons. I really do. But the real danger of having a cyst this large is in having the cyst and ovary twisting on itself (torsion) and becoming necrotic which is a medical emergency. It’s also not easy wondering if the cyst in your pelvis might be cancer. And it’s very easy to go to that place in my mind given where my journey has been since January 2013. So to be honest, I have spent quite a bit of time in recent weeks and over the weekend wondering if I have in fact Ovarian Cancer or Breast Cancer mets to my ovary. The Dread Dragon paid me a visit over the weekend and even Mr Cool has been under his spell. The ongoing threats to my health are wearing us both down. abdominal bloating or a feeling of fullness (when eating little). back, abdominal or pelvic pain. The issue with such vague symptoms is that many women experience these symptoms ALL THE TIME. And some of these symptoms normally present when Ovarian cancer is advanced which obviously leads to a much poorer prognosis. I guess the point again is listen to your body and see your doctor if things don’t feel right. Listen really attentively. Pick up on the whispers. Women are the best judge of their own bodies. Yesterday’s great Ovum and Endometrium in the sky. At the end of an exciting week which saw an upper abdominal ultrasound, trans vaginal ultrasound and a pelvic inspection which included both vaginal and rectal exploration, (Imagine adult hand, glove, lube and small talk). Dr OG (that’s Oncological Gynaecologist) suspects that based on my hormone levels and bloods it isn’t suggestive of ovarian cancer at this stage, but he can’t rule it out without actually removing the ovary. He said I would be very, very unlucky if it turned out to be Ovarian Cancer which is more likely if you are over sixty or carry the BRCA genes, which I don’t. So the plan is we will try the wait and see approach. Rather than expose me to unnecessary surgery now, when the odds are more favourable that the cyst is benign than not, we will look at it again in four weeks. And that means I get to experience the joy of another trans vaginal ultrasound! Yay! If the complex cyst hasn’t resolved on it’s own by then, if it is still the same size or larger then it looks like there might be surgery to remove my ovary, or both ovaries and remaining Fallopian tube. I lost one a few years back and nearly died but that’s another story. There may also be a need to review my relationship with Tamoxifen. Dr OG is betting that the complex cyst will resolve sometime soon, and given the thickness of my endometrium, Aunt Flo might be paying me a visit in the near future after all. And when she arrives she could be quite a doozy, if you know what I mean! Better put the kettle on and see what the next four weeks brings. Surprisingly, this new found situation of reemerging fertility actually caused me to think about having more children. For a few minutes yesterday in the car I found myself lamenting all of those perfect little eggs of mine that would never get to meet with my husbands DNA and become another of the most divine little creatures we already have. Maybe we could find a surrogate? No, no. Stop thinking about that. Then some tears. That part of my life is over now. It’s taking the potential return of my fertility to remind me of that loss. After not having a period for thirteen months and thinking of myself as menopausal for a long time it’s a bit strange to be entering the fertile fray again. One thing is clear, I’m definately in no rush to go out and buy myself a nice pair of cream pants! Hell, I might even throw myself a period party. Dress code… red of course. Did I just type all of that? Why yes I think I just did! It never ends, right? I have cysts too, and very large ones too (just pulled out my reports… one is about 7cm). Discovered them because I had major pelvic pain, on several separate occasions. Likely a ruptured cyst. The doctors seem to act as if this is something unusual, yet it seems EVERYONE I know on Tamox has developed cysts… so I don’t understand why we aren’t warned about this ahead of time as a side effect/risk. Anyway, I’ve now had three pelvic/TV ultrasounds to keep checking on them. A couple were complex, then the next time they weren’t. Some went away completely, some shrunk, some grew, and some new ones popped up. 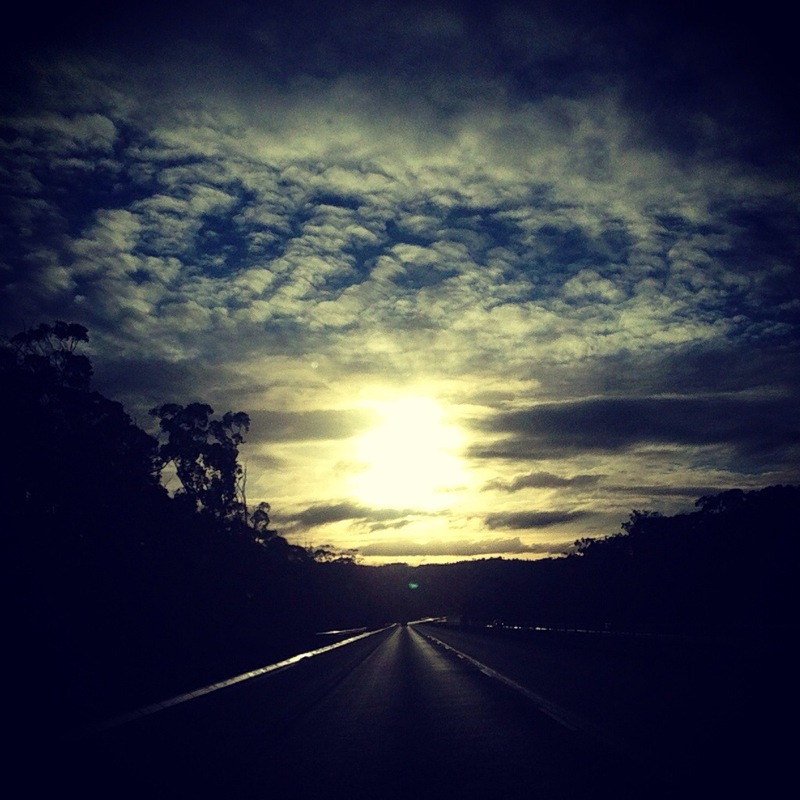 So they definitely come and go and change… I bet yours will do the same. It’s totally annoying. But luckily, almost 100% tamox-related (according to all the research I’ve done) and not cancer-related. So that is good! My period was doing the opposite… started getting it fairly regularly (every 5 weeks) but now it’s seem to completely have disappeared. But apparently that is also very common on tamoxifen. Who knows! All this to say… I feel ya. Oh Lisey, I wish you the very very best. I’ll be thinking of you in the next four weeks. When is the Red party? 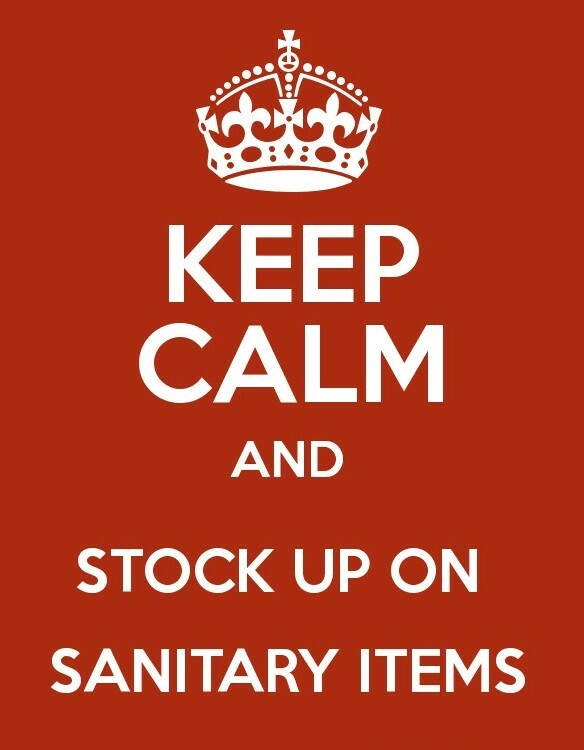 Red is never a great colour in the world of Sanitary items. Why don’t they just make them red? What do we need to do to get an invite to the party? You can come Harry if you dress as a giant uterus.